I'm back after a much needed break. The last couple of months have been very difficult for me on many levels, and while I don't feel like I'm out of the woods yet-so to speak- I think that things are starting to look up. So if you are reading this, thank you for sticking around while I sort my life out. Anyway, that's not what we are here about, so lets get on with it, shall we? We <3 RP is also coming back from a break and I am excited about a some of the preview items I've seen so far. My current build is a combination of Neo-Victorian and haunted house, so I felt that it needed a proper hedge maze. Digs made a great evergreen hedge set in mesh that was perfect for the task. I also added a stone altar that I found at Artisan Fantasy, and a couple of sculptures made by Organica in the center portion of the maze. 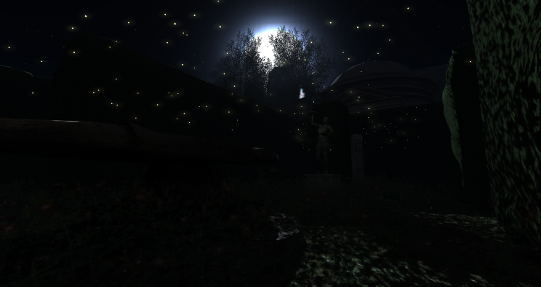 But I think what was the most exciting was the spirit flame lights that Paper Moon made last month for an event, and these brand new firefly lights that will be out for We <3 RP in a couple of days (they open on the 4th, and the sim is recently redecorated). I know Alegria from making clothes and accessories, and when I saw that they had produced a low prim, moving firefly cloud, I was all over it. The packs come with 3 sizes, 1x1(2 prims), 5x5(2 prims) and finally a huge 10x10 cloud that is only 8 prims! There are also various colors to suit any environment (I chose vanilla). 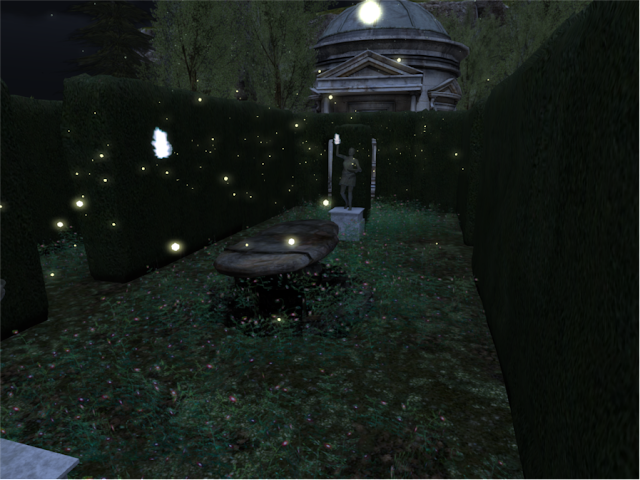 I was really pleased by the added ambiance it brought to my maze, and as you can see with the moonlight WL setting, the combined look is quite mysterious!